All tools and materials provided, registration limited to 15. 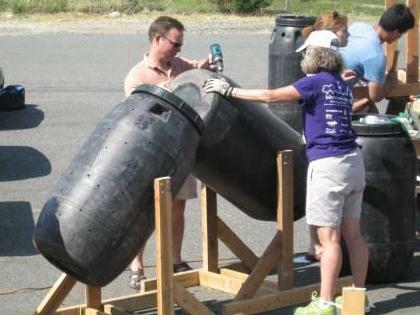 Participants will start this workshop with a pile of recycled lumber, a recycled pickle barrel, and assorted screws and bolts, but you will leave with a fully functioning tumbler style composter! We will take you through the construction steps and also give you some primers on proper composting technique. The finished composter will hold 55 gallons of organic material. All lumber will be pre-cut and all tools and materials will be provided. The cost of the workshop is $75 and registration is limited to 15 people, although you may bring helpers to assist with the construction. Workshop is hosted by the Northern Virginia Soil and Water Conservation District (NVSWCD). For more information or to register for an upcoming class email recycling@fallschurchva.gov.